Lonely Fuko has been trapped ALONE FOR 10 YEARS. Please help her have a better life! Fuko the elephant has been alone for 10 years—after losing her companion Dumbo in 2008. For 25 years, Fuko and Dumbo spent every waking moment together in the same enclosure. At least back then, they had each other. Now Fuko is forced to spend most of her days trapped alone in a tiny, featureless concrete cell at Nagano Chasuyama Zoo in Japan. To cope with her loneliness, she tries to interact with zoo visitors by following them and reaching out to them with her trunk. Totally alone, bored and lonely, Fuko has found another disturbing way to cope: EVERY DAY, HUNDREDS OF TIMES A DAY, Fuko paces in a routine repetitive pattern, over and over and over in her tiny indoor enclosure. #1: She backs up to the far left wall of her cell #2: Walks to the far right side #3: Walks to the front right corner #4: Walks to the front left corner, and touches her trunk to the bars of her cell. Watch the actual video footage, HERE. Fuko's repetitive pacing is an abnormal stereotypical behavior that is often seen in captive wild animals kept in substandard enclosures. They are often associated with boredom, anxiety, frustration and depression—and they mean that Fuko's biological, behavioural and social needs are not being met. Solitary confinement is an undeserved punishment for an animal that is naturally highly intelligent and social. Elephants live up to 60-70 years, and are exceptionally social animals who have families and friends. They grieve their dead. But finally Fuko's plight has come to light! Fuko still has a chance at a better life: experiencing soft soil on her feet, companionship and enrichment to occupy her very intelligent mind. The Elephants in Japan campaign is working with top elephant experts and organizations to help Fuko and other solitary elephants in Japan. BUT we need your help! Please sign and share this petition demanding change for Fuko! The more voices we can add to this cause, the more power we have to approach our targets and demand change. 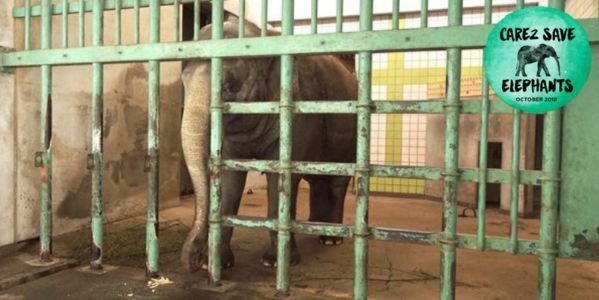 In Japan, this is pushing for the government and other relevant authorities to develop legislation that sets higher standards of captive elephant housing and care, including prohibiting the keeping of highly social animals, like elephants, in social isolation. THANK YOU FOR YOUR HELP TO SAVE FUKO!